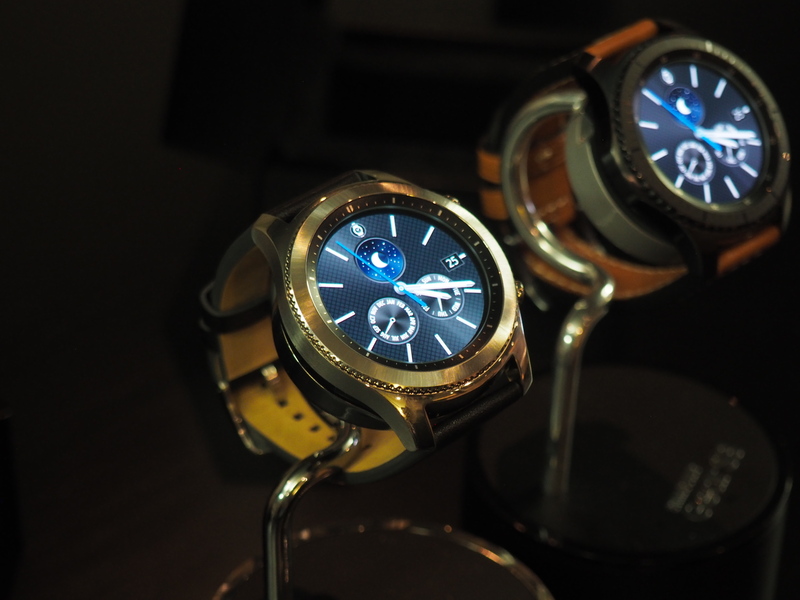 Last year’s Gear S2 was, without question, one of the best looking smartwatches around. After a few generations of unwieldy wearables, the company took it down a few notches with a device that was smaller and decidedly more minimalist. Where other companies have looked to bling it up, the electronics giant stayed subtle. Announced this week at IFA, the S3 isn’t that. The company happily notes that it teamed with Swiss designer Yvan Arpa to create the decidedly more gaudy device, fit into a larger 46mm design. It’s a big watch. I’m 5’11, I tried it on, and it felt big. Just for fun, I asked our video producer Veanne to try it on. She’s a fair deal smaller than me, and the thing was giant on her. 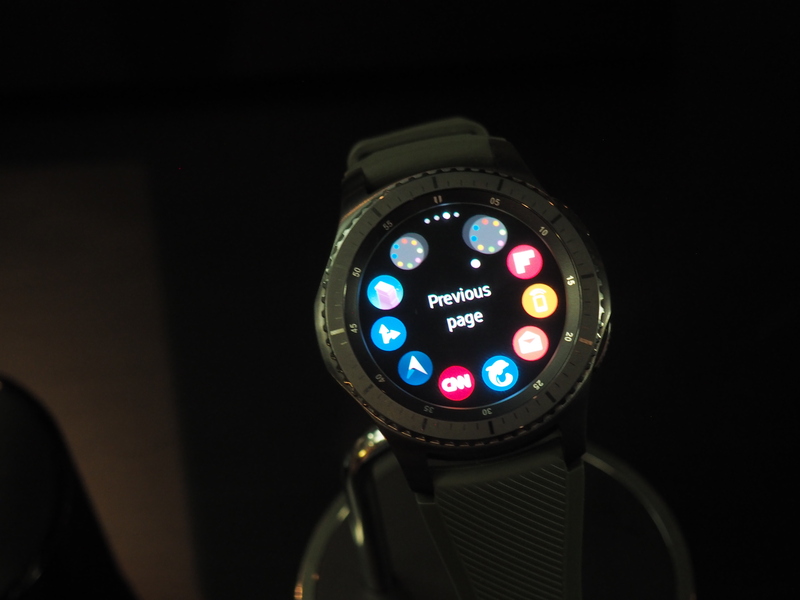 I realize that I’m being fairly negative right off the bat – I should add that it’s not a bad-looking watch, and it looked pretty snazzy on the Samsung reps wearing it with a business suit. And hey, I’ve been wrong about big Samsung devices before, but for the sake of inclusiveness, the company really ought to have issued the hardware in different sizes. There are two variants of the S3, incidentally, the Classic and Frontier, the latter of which has a more ruggedized design with IP68 waterproofing and military level durability (and an LTE option, incidentally). Both maintain the aforementioned 46mm size wrapped around a 1.3-inch AMOLED display, the first to utilize Corning’s ultra scratch resistant Gorilla Glass SR+. There’s a bigger battery on the watches, upgraded to 380mAh. The company hasn’t issued an official estimate, but says it should get around three or four days on a charge (a full day improvement over the S2) – that’s despite the much welcome addition of an always on display. The cool and innovative spinning case control is back, coupled with an enhanced widget layout. There are some new controls as well, including turning to take or reject calls, snooze and dismiss alarms. And indeed, controlling the watch is quite easy after a minute or so of learning the ropes. The S3 has a built-in speaker and a whole bunch of sensors, including a barometer, altimeter and GPS. Users can stream music from Spotify directly onto the watch via WiFi or LTE, in the case of the Frontier. MST has been added to the Samsung Pay options, greatly opening up the number of spots that it’ll work with. Incidentally, the S2 is still sticking around and will be getting a software update, as well. Price looks to be staying put for now, at least. As for the S3’s price – that’s still TBD. It arrives in Q4 of this year.